A spot opened up for me to attend the Front Range Modern guild retreat this weekend. I am beyond thrilled to have this opportunity. I think it will be a great way to get to know the other guild members, it will feel like a "break" after such a stressful move, and I get to sew non-stop for a whole weekend! The only problem I have is this: I have no idea what to bring to work on. In my opinion, retreat sewing is awesome for doing a project that you wouldn't finish at home: the clamshells were so time consuming and frustrating but I was able to persevere thanks to encouragement and distracting conversation with guild friends. I am in a good spot right now with my sewing in having a very blank slate ahead of me: I have very few UFO's and I have lots of fabric that I love, just waiting for me to finally cut into it. I also believe that it is important to choose a retreat project carefully. I don't want to bring too much stuff. I don't want to monopolize a design wall or an iron. I don't want to bring a project that requires a difficult technique that will make me feel frustrated, I need to bring something I am comfortable with. I am slowly working on the Feathers quilt and you can see my progress below. I think I will bring this project but I don't think it will be my primary focus- the way that I am approaching it's completion is difficult because I am not making identical block after identical block- I am trying to create a gradation of color that will make every block different- so I will constantly need to cut, press, and cut some more with minimal time at the sewing machine. The Jacob's Ladder quilt from Blue Elephant Stitches has been on my "to do" list for a while now but I am not excited about the prospect of making 196 HST units. I bought some "Thangles" at a LQS but bought the wrong size, I went back to buy the right size and they were out of stock. Another LQS tried to help me but I was out of luck there too. I ordered some online but I am quite sure they won't come in time for the retreat. Last night I spent over an hour in my sewing room and on the computer looking at patterns, blogs, Pinterest, and my fabric stash. The sewing room is kind of a mess now. 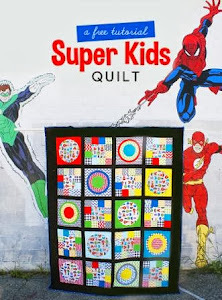 I am intrigued with the idea of doing another quilt with bright colors and black/white fabrics. 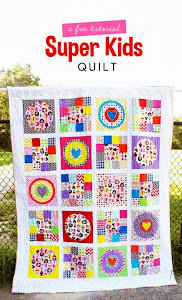 I am contemplating something like this Liberty Love quilt or maybe a Penny Patch with Flower Sugar as the main focus. My only hesitation is that these patterns are easy and I have been itching for more of a challenge. I know the BMQG retreat is coming soon- any ideas from my friends in MA? If you've ever been to a retreat, what strategy have you used in planning your projects?